John Spritzler is a Jewish American peace activist who has been working very hard to expose the truth about the Israeli-Palestinian conflict in his native city of Boston. He holds a Doctor of Science degree in Biostatistics from the Harvard School of Public Health where he was employed as a Research Scientist engaged in AIDS clinical trials. Q. John, how would you define yourself besides being a Jewish humanitarian and peace activist? I am a person whose ancestors on both sides are all Jews (as far as I know), but I do not identify myself as a Jew other than to acknowledge my Jewish ancestry. Israel has no particular personal meaning to me, any more than another foreign nation such as France. I don't speak Hebrew. I like bagels but I hear the Israelis don't eat bagels much. I have absolutely no desire to travel to Israel. Q. You have been very active in your city Boston and you firmly believe there has been a shift in public opinion, right? American public opinion is definitely changing in regards to Israel. In the past, most Americans thought Israel was a nation representing the innocent survivors of the Holocaust and therefore one should support Israel no matter what, in order to avoid being an anti-Semite. But that is changing, big time. The enormous atrocities that the Israeli government carries out against Palestinians, especially the frequent periodic massacres of Palestinian civilians, is making many Americans--including Jewish Americans--start to question the idea that the Israeli government is deserving of support. Students on college campuses--including Jewish students--are starting to support BDS in growing numbers. Just before Operation Cast Lead (an Israeli massacre of Palestinians in Gaza in 2008) the largest Jewish synagogue in Boston, where I live, displayed a large banner on the outside of its building that said, "We Stand With Israel in Its Quest for Peace." After Operation Cast Lead, that banner was taken down. I know a person whose parents are in the congregation and they confirmed that the banner was removed because of opposition to it from the congregation. I have seen this same banner disappear from other synagogues as well in Boston. We were just a handful of people and it was all we could do to get the question on the ballot. We were unable to do any “propaganda” work to persuade people to vote Yes. Voters in one district, the 2nd Suffolk district of Charlestown—Chelsea voted 48% in favor but came up short in passing the ballot question. This district is one in which, unlike the others, a majority identifies as Hispanic or Latino, and possibly more voters there had trouble reading and understanding the English language ballot question wording. 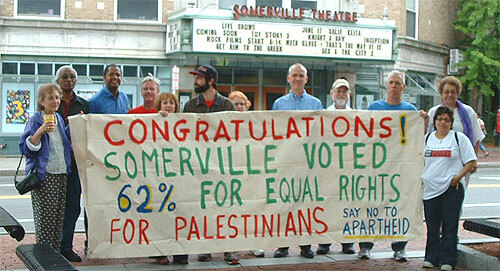 "The Somerville Divestment Project has divided Somerville residents by bringing up far-away, world conflicts in a municipal context. Reject the tactics of the Somerville Divestment project and vote no on Question 4." Apparently the voters saw things differently. What this election result demonstrates is that when the issue is framed as being for equality or for inequality under the law, people voted for equality, and not for the Zionist principle of inequality. In the years since 2008 American public opinion has continued to change in the direction of seeing the Israeli government as committing unjustified violence against Palestinians. The recent Great March of Return has also forced some American mass media (such as the Los Angeles Times) to do what they never did before, which is to tell their readers that the actual grievance of Palestinians is that Israel denies their Right of Return and that the issue is Israel's ethnic cleansing, not "anti-Semitism." Zionism and apartheid are each words that mean ethnic cleansing, extreme racial/ethnic discrimination. This discrimination is so brutal and violent and unjust that of course people talk about it. What is less talked about, unfortunately, is the fact that the ruling elites use such discrimination in order to divide-and-rule and oppress ALL of the ordinary people involved, both those who are the direct victims of the discrimination (Palestinians in the case of the Israeli ruling class) but also the ordinary people who are NOT the direct victims (ordinary Israeli Jews in the case of the Israeli ruling class). Zionism is an ideology that a Jewish ruling upper class (of billionaires and generals and politicians) uses to make ordinary Jews in Israel obey it even though that upper class oppresses them economically to enrich itself at their expense. The ideology says (falsely) that gentiles are innately and permanently anti-Semitic and that therefore the only way that Jews can live safely in the world is by having a "Jewish state" that is guaranteed--by whatever means necessary including violent ethnic cleansing--to be always at least 80% Jewish. The Israeli ruling class then tells ordinary Jews that the Palestinian anger is anti-Semitism, and that Palestinians want to kill Jews just because they are Jews. This is a lie. Most Palestinians want only for the ethnic cleansing to end and to be compensated fairly for the property that Zionists stole from them and to be allowed to live in all of Palestine as equal to Jews under the law. But Hamas does things that make the lie seem credible: it tries to kill not just Jews who are violent against innocent Palestinians (which is justifiable resistance) but also ordinary non-combatant Jews (which is unjustifiable terrorism) and says its goal is to make Islam sovereign in all of Palestine (including the part called Israel). The Israeli ruling class needs ordinary Jews to believe the lie that Hamas makes credible, and this is why the Israeli ruling class funded Hamas and absolutely and knowingly benefits from the existence of Hamas. For the Israeli ruling class, Hamas is the perfect enemy. The Israeli ruling class gets ordinary Jews to obey it by claiming that it is defending them from their "real enemy": the "Arabs" or "Palestinians" or "terrorists." Whenever ordinary Jews rise up against their economic oppression by the Israeli ruling class (as they did in huge anti-government demonstrations in 2011) the Israeli government foments some incident in Gaza or the West Bank and demands that the Jews be patriotic in the war against the Palestinians and put aside their complaints against the government. So far, this Zionist method of ruling class social control has worked. Zionism is indeed apartheid. It is based on the idea that Jews and gentiles cannot live together as equals, and that gentiles must be removed from the "Jewish state." If that is not apartheid, then nothing is. John is a retired senior research associate at the Harvard school of public health and the editor of new democracy world.org and of PDR Boston.org. “Divide And Rule: The Left vs. Right Trap” published in 2017. “The Israeli Ruling Class Exposed: It Oppresses Ordinary Jews As Well As Palestinians” published in 2017.